Serena Williams had to fight off the effects of a cold before reaching the fourth round in Paris. 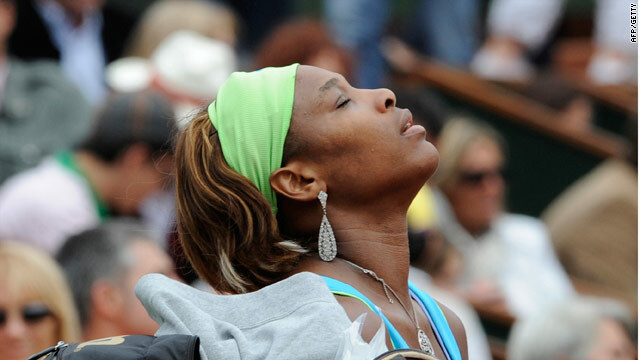 (CNN) -- An ailing Serena Williams came through a topsy-turvy third round encounter with Russia's 29th seed Anastasia Pavlyuchenkova to reach the last 16 of the French Open in Paris. Top seed Williams easily took the opener, but was trailing 0-5 in the second set when she needed on-court treatment. Her 18-year-old opponent duly leveled at one set all but the world number one broke twice in the decider to wrap up a 6-11-6 6-2 victory. Williams will now play Israel's Shahar Peer for a place in quarterfinals, but admitted she was below-par. "I just ran out of a little energy. I'm fighting a cold and sickness. But I'm feeling better and getting ready for the doubles," Williams told AFP. "It was a weird match. I wasn't at my best. I was just happy to win, especially against a player who's on the up and up." Williams, who is seeded to face sister Venus in the final, is chasing her 13th grand slam title after winning the Australian Open in January. Later, four-time French Open champion Justine Henin and Russian star Maria Sharapova were locked at one set all after a tremendous battle in the light rain and evening gloom. Henin looked set to sweep to an easy win as she took the opening set 6-2 but former world number one Sharapova showed her fighting quality in the second set. She fought off strong pressure on her own service before breaking herself to lead 5-3. Sharapova duly served out to level a match which will be decided on Sunday. At the same time, fourth seed Jelena Jankovic of Serbia rounded out a 6-4 7-6 win over Alona Bondarenko of the Ukraine to earn a clash against Daniela Hantuchova. The Slovak earlier impressed with a 7-5 6-3 win over Yanina Wickmayer of Belgium. The two remaining home hopes in the women's draw exited in third round matches with Nadia Petrova of Russia putting out Aravane Rezai in a three-set marathon. A tense match had been suspended at 7-7 in the deciding set on Friday night and Petrova duly wrapped up a deserved, if unpopular, 6-7 6-4 10-8 victory when play resumed. Rezai, who had won the prestigious Madrid tournament in the build-up to Roland Garros, was soon followed out by compatriot Marion Bartoli. The 13th seed went down 7-6 6-2 to Peer.